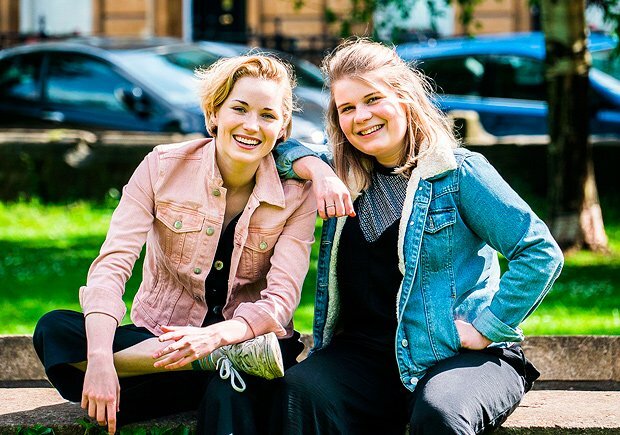 The title of Deadpan Theatre's Third Wheel does nail one aspect of its story – a road trip for two girls following a route chosen by the third, deceased party – but doesn't capture the freewheeling tone or the sense of fun involved in this one-hour play. Writers and performers Jude Mack and Eliot Salt play Eve and Polly, two girls who have developed a friendship but now suffer from a broken romantic bond. Attending the funeral of their friend Dylan (Harry Trevaldwyn), they're handed a memory stick with a video message from beyond the grave. In a bid to mend the fallout between the girls, Dylan sends Eve and Polly on a cross-country trip with Dylan's ashes in a Wizard of Oz lunchbox, a journey which quickly sees long-standing disagreements come to the fore, but eventually heals some of the unrequited hurt that's been festering between them. Third Wheel is also a musical, with an on-stage band called Party in the Sky and some funny cod-Broadway pastiche songs to accompany the action. Sophie McQuillan and Finbar Fitzgerald play the various characters encountered on the journey with gusto, and while the play relies a little too much on montages at the expense of dramatic conflict, Mack and Salt's strategy of packing in a plethora of incident eventually pays off in a bitter-sweet finale. The language and situations tend towards the sexually explicit, and one scene involving a gynaecological examination might use some judicious editing. But the biggest strength of Deadpan Theatre's production is Mack and Salt, a strong double-act playing mismatched characters, milking both the comedy and the pathos from the narrative with ease. It's refreshing to see a show that aims for, and hits, a range of targets, comedic or otherwise, with such success. Gilded Balloon Teviot, until 27 Aug, 2pm, £10–£12 (£9–£11). A dark wee tale about grief, love, and coming to term with both emotions.